Summary: This project will conduct field tests of a novel solar-powered geopositional archival tag based on the Earth’s magnetic field for comparisons with standard tracking methods by ARGOS transmitters. The development of the new tags holds substantial promise to revolutionize the accessibility of marine vertebrate tracking, but has yet to be given a rigorous evaluation with tracking sea turtles. A concurrent satellite tracking program and histories from previously tracked loggerheads by Mote Marine Laboratory enables an accessible suite of animals with known histories or that can be tracked as needed for a test-bed. The results will enable biologists and managers to quickly evaluate a low cost and accessible new technology with specific advantages to document movements. The proposal provides a baseline for future broad scale assessments of geospatial activities by marine vertebrates. The deliverables establish a useful tool for federal, state and local managers that seek to cost-effectively document sea turtle nesting, internesting movements, post-nesting migrations, and foraging residency. Results: Field work completed: The 2010 Casey Key loggerhead study tracked 23 loggerheads, using GPS (5) or ARGOS (18) tags to provide benchmarking for the evaluation. Desert Star Systems staff visited Mote Marine Laboratory to trouble-shoot hardware and software on 6/14, and by night assisted geomagnetic tag deployments on satellite tracked female loggerheads on 6/15 and 6/16. 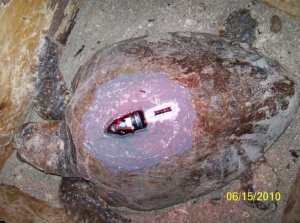 Sixteen Seatag-Geos deployments were conducted in 2010, and four within season Seatag- Geo evaluations were possible from dataloggers removed from internesting turtles. Hardware and software teething problems were resolved during a site visit by Desert Star staff. Additional benchmark tests of seven tags were devised by 10 days of hourly static positions at a beach or outdoor lab with frequent data archiving and daily averaging. These test data were submitted to Desert Star to determine sources of geomagnetic anomalies and thermal dependency. The adjustments to algorithms resulted in improved accuracy and software revisions to Seatrack 2.0.